Join the Latin with Andy membership site! If you've already joined, click here to log in and get learning! After you've registered, click here to jump in and get started! Check in with us if you have any trouble: billing (at) latinwithandy (dot) com. Enjoy! This is a subscription, like Netflix, so if you don't want us to continue charging you for continued access, click on the "My Account" tab once you're logged in, and you can cancel the recurring payments (just remember which billing option you choose below). This will only cancel the recurring payments, not the access you paid for. You'll be able to enjoy all the time of your membership without having to worry about a recurring payment. If you want to see what all is included, click here for more information, or try out Lesson 1 for free! What a great idea you have here–helping others learn Latin more easily and helping your family make income. Brilliant! Here’s to successful learning and entrepreneurship! Do you ever have any discount coupons? There are discount codes for people who have previously purchased charts or flashcards. Hi, are all lessons available for the entire year, or do they expire after a certain length of time? Can you view lessons more than once? Thank you for sharing this resource! I LOVE your vocabulary cards! The membership gives you access to all resources for the term of your membership. You can watch them as many times as you want, or if you have multiple children in different levels, you can start wherever you like. It’s really just a resource library to use as a tool for your learning! It would probably be a bit early. If you’ve made it through a year of Essentials, it will all make more sense. I’ll be sharing a resource in a couple of weeks that will be a great way to ease in to your Latin studies for younger Foundations students. Would these lessons go well with the new Latin Workspace recommended in Challenge A? Yes! They are just short videos demonstrating concepts from the exercises in Henle’s First Year Latin. The hope is that seeing the exercise demonstrated will help students understand how to do it with tips for getting the correct answer (and knowing why they’re right)! We are starting Challenge A next year for my son who has severe dyslexia. How will this work in conjunction with his homework/work for CC in Latin each week? These videos just correlate with the exercises that you’re completing in the Henle book. So if you’re assigned a certain number of exercises for the week in Challenge A, you’d just watch the corresponding videos before you complete the exercise. Our goal was to help clear the fog of some of what is expected from each exercise so that you can just focus on the Latin and not always translating the instructions! Can I view a sample somehow before committing to buy a membership? Thank you! These are fantastic! Thank you for all your hard work! I noticed that the youtube vocabulary flashcard videos only go through Lesson 3. Do you plan to make videos for the other lessons? Or is there another place to look for other videos? They are extremely helpful with the pronunciation of the words! Thanks! Andy has made some more of these, but we just need to upload them! Thanks for the reminder! If I do the quarterly option and then decide that my daughter loves it and wants to commit to the year, can I use the quarterly payment I made toward changing it into a full year subscription? Thanks! At this time we have not set up payments to work as an installment plan. That’s not exactly what this is, but similar. Though we understand this legitimate concern, our system is not set up for it. If it’s uncertain how your daughter would respond, I recommend simply going with the quarterly option and upgrading if she does love it. Sorry for any inconvenience! having trouble registering/paying, says dprp is disabled for you’all. could you give me any advise??? thanks a bunch!!! My son is headed into Challenge II for CC. Will the lessons correspond with what he is studying and how long do they take to watch? The videos for Henle 2 are around 7-10 minutes, but cover multiple exercises from the Henle 2 text. There are also reference videos back to concepts from Henle 1 for review. We have the first 8 lessons uploaded at this point, but we should have the whole book completed by the end of September 2018. Can I view a sample of what the videos are like before I buy a membership? Thank you! Absolutely! You can check out the videos for Henle 1: Lesson 1 or the Henle 2: Lesson 1. Hi… if I subscribe will my challenge a student be able to view Henle 1 and my challenge 2 student be able to view Henle 2? Hello! I have a challenge 2 and challenge A student. Does Andy have videos for level 2? Do you have printable quizzes and tests for A and 2? Andy does have videos for Henle 2, but only vocabulary quizzes/tests for Henle 1 at this point. I have tried to print the documents the correlate with the lesson but I can’t. It says too many redirects. Can you help? I just sent you an email with help! My school district purchased a subscription for my son using my email, but they paid. They have a special homeschool program. They keep asking me for an invoice email from you. I haven’t seen one come through my emails. Can you resend me one or send one if you haven’t. I just sent you an email with a link to the receipt. Let me know if you still don’t receive it. We are a CC family. I was wondering if Andy goes thru every exercise ? Yes, Andy goes through every exercise “concept by concept”, which just means he explains the Henle concept using different vocabulary. Book one and about half of Henle 2 is complete! Do you cover Henle II and in what order? I am in the CC Chalenge II program. We currently have videos through Lesson 18 in Henle II. We are scheduled to release the next few lessons very soon. 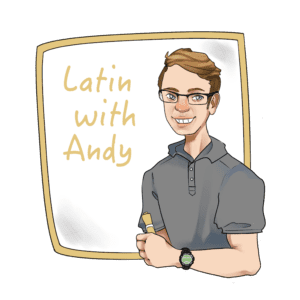 The Latin with Andy site is more of a resource site, so you can go in any order you want. All the videos are available to you, so no matter where you are in the CC program, you can access the exact videos you need. Andy takes you through each exercise and explains concept by concept. Hope that helps! Thank you so much for making this astounding website my daughter has truly grown in latin thanks to y’all!!! We have misplaced our login information. Would you be able to help us out? Thank you for your help and your wonderful resources. You should have received a separate email from us about log in information from billing@latinwithandy.com. Let us know! This will be a great resource! We actually created it to help my nephew who was joining Challenge 1 in the same way as your son. However, unless you LOVE Latin, you have to be okay with a slow and steady approach to learning. This will be a great way to get your feet wet, but have patience in the process! It takes time to learn! Focus on the grammar (how to form nouns and verbs) and vocabulary. Don’t drown in the exercises. He’ll be able to join in the conversations in class with no problem.